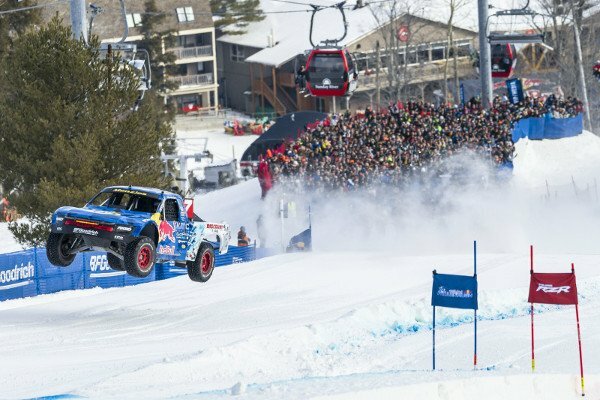 The Red Bull Frozen Rush, that lunatic ice track trophy truck speed spectacular, came back for its third year this time to Newry, Maine. And the winners were familiar faces. To kick off the snow-and exhaust filled winter race, nine veteran drivers lined up for glory, all competing in 900-horsepower Pro 4 trucks, equipped with custom spiked tires from BF Goodrich. The weather was dead right for the opening elimination round, and the crowd enjoyed the sun and snow as the racers bombed like RC cars over intersecting ramps, banks, and straight-aways of snow and ice. The race saw trucks in slalom duels, with some tumbling end-over-end, and others actually experiencing fires inside their cabs. These were single elimination rounds, pitting two drivers at a time against each other, the loser being excused, and the winner moving up to battle a narrowing field of high-end qualifiers. Insane footage from dash cams caught near collisions as trucks soared above others, all throwing snow and raw kinetic energy. By the semi final round, only four were left. Rob MacCachren was up against Bryce Menzies, and Carl Renezeder faced Ricky Johnson. The die was cast: only one winner would emerge. In the end, 28-year-old Las Vegas native Bryce Menzies gave a flawless driving performance into the final round where he ultimately but narrowly beat Johnson, who drove with an abandon that at times had his truck flying sideways. After six laps, Menzies blasted across the finish line first, giving him back-to-back Red Bull Frozen Rush Championships.